If you are missing one or more teeth, it is crucial that you find the right tooth replacement option to restore your smile. The longer you wait to replace missing teeth, the more likely you will experience complex dental problems associated with tooth loss. Dunnellon, FL dentist, Dr. Carter Perkins offers a full range of tooth replacement options at Perkins Dentistry. Dr. Perkins can work with you to help you make informed decisions about your tooth replacement solution. During your visit, Dr. Perkins will perform a thorough dental health exam to determine if your missing teeth were caused by an underlying dental concern. After your consultation, Dr. Perkins can make an informed decision about what tooth replacement options would be best for your specific case. At Perkins Dentistry in Dunnellon, FL, we analyze and treat the whole mouth for long-term and stable oral health. Aesthetics: Missing teeth can affect the appearance of your smile. Patients who are missing teeth may suffer from a lack of confidence and tend to hide their teeth when smiling. At Perkins Dentistry we believe that every patient should have a smile they are proud of. Oral Health: When patients are missing teeth they may have an increased risk of developing gum disease, infection, and further tooth loss. When a tooth falls out, the bone that supported the teeth begins to deteriorate. As the bone deteriorates, the face may loose volume and appear sunken. Missing teeth can also affect your bite, which can contribute to TMJ disorder. 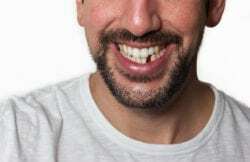 Function: When you are missing teeth it can hinder your ability to chew, which can make eating uncomfortable and even embarrassing for some patients. Your ability to speak can also be affected by missing teeth. Certain words or sounds may become challenging to pronounce depending on the location of your missing teeth. To learn more about your tooth replacement options, visit Perkins Dentistry in Dunnellon, FL. Dr. Perkins may recommend dental implants, dentures, or a dental bridge to restore your smile. To schedule an appointment, call (352) 440-5827 or schedule an appointment online.